Michigan continues to roll on the recruiting trail as they have secured a commitment from 2016 Safety Devin Gil (Hollywood, FL). Gill, who visited Ann Arbor last weekend, decommitted from Miami (FL) while visiting and it seemed like it was just a matter of time before he became a Michigan pledge. After watching Devin’s highlight reel, I firmly believe that he could be one of the most under-rated prospects in the 2016 recruiting cycle. Throughout his film he shows the ability to play Safety at a high level and has all the physical attributes to continue this at the collegiate level. Devin has a solid first step and easily identifies what the play will be. On rushes, Devin is extremely quick to get back into the box and support the blitz. He does an excellent job of shedding blocks quickly which makes him cause more pressure on the ball carrier. Has good speed and can cut across the field to make a play. In pass situations, Devin is extremely patient and does an excellent job of keeping the play in front of him. He’s extremely fluid while covering receivers and can undercut the route for interceptions. For a Safety, Devin has very soft hands and usually once a ball hits him, it’s picked off. Has solid speed and takes good paths to the ball. With his speed Devin his very useful in blitz situations as he’s able to get to the edge quickly. A good tackler, who hits hard and usually will bring his man down without any additional help. Shows solid instincts throughout his entire film. After watching his Junior and Sophomore film, Devin has made excellent strides in his game and this should continue on throughout his Senior season of High School football. Devin becomes Michigan’s second commitment of the year from Charles W Flanagan High School, as earlier in the week his teammate Josh Metellus committed to Michigan earlier in the week. 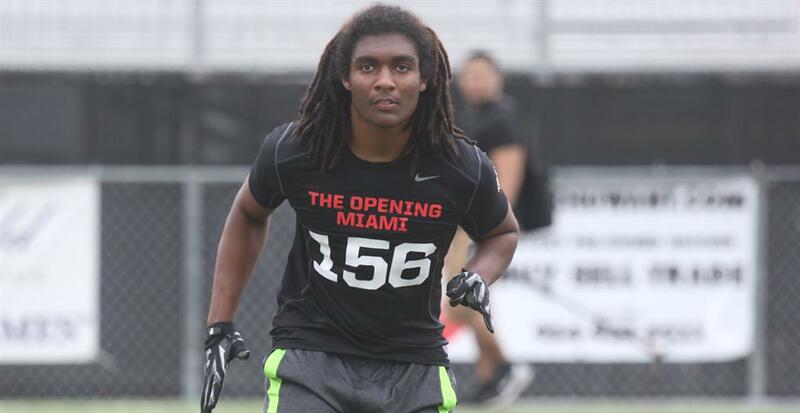 The two will surely try to lure 2016 LB target Devin Bush Jr. into joining them in Ann Arbor. Michigan continues to expand their recruiting footprint across the nation as they now have commitments from nine different states. Gil becomes Michigan’s seventeenth commitment in the 2016 recruiting cycle joining; OT Ben Bredeson, OG/DT Michael Onwenu, OT Erik Swenson, QB Brandon Peters, RB Matt Falcon, ATH Chris Evans, LB Dele Harding, LB/FB David Reece, QB/ATH Victor Viramontes, ATH Kiante Enis, RB Kingston Davis, CB Antwaine Richardson, LB Dytarious Johnson, TE Sean McKeon, S Josh Metellus, and DE Rashad Weaver. With two Safeties now committed to Michigan, the recruitment of the position will likely be done and the coaching staff will focus on other positions of need such as; Wide Receiver, Tight End, Linebacker, Cornerback, Defensive End, and Offensive Lineman.